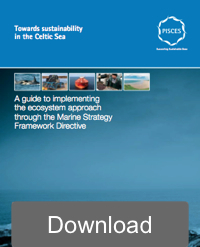 This section summarises the key recommendations on implementation of the ecosystem approach in the context of the MSFD. Recommendations were developed for stakeholders (primarily sea-users) and government (including national competent authorities, the EC, OSPAR and other international government agencies) and can be applied to the Celtic Sea and other regions. Be assertive and organised in order to maximise participation opportunities – don’t assume opportunities will automatically be offered. Participate actively in the process of identifying and evaluating measures, to help ensure they are appropriate, cost effective, affordable and enforceable. Advocate and support the development of mechanisms to support stakeholder participation (e.g. national and regional-seas forums). Continue to identify and implement voluntary measures that address environmental issues and consider ecosystem services. Encourage others to do the same. Seek opportunities to work with others, including government, marine industries, NGOs and the scientific community, to identify and implement voluntary solutions. Make government aware of how voluntary actions are helping to meet policy targets, to reduce the need for regulation and enhance the case for a voluntary approach. Share information on technological advances and initiatives through appropriate channels (e.g. newsletters, websites, stakeholder forums). Seek opportunities associated with the MSFD (e.g. undertaking research and monitoring, diversifying activities, obtaining finance). Implement marine spatial planning – to provide the overarching framework for integrated management of human activities required by the ecosystem approach. Engage proactively with stakeholders and involve them throughout the implementation process (not just consultation), to help meet statutory requirements, deliver well-supported outcomes and conserve public resources. Develop clear and transparent stakeholder engagement strategies, setting out how stakeholders can participate in the implementation process. Use stakeholder knowledge and experience during the identification and evaluation of measures (e.g. to help determine feasibility, effectiveness, costs, benefits and impacts). Advocate and support the development of mechanisms to support stakeholder participation (e.g. local, national and regional-seas forums). Support and encourage voluntary measures that address environmental issues and consider ecosystem services (e.g. through funding, incentives, partnership-working and education). Explore the potential for voluntary measures to help meet MSFD targets, and to advocate their inclusion directly into the statutory programmes of measures. Explore ways of enhancing opportunities associated with the MSFD (e.g. awarding research and monitoring contracts to stakeholders, supporting the diversification of activities, providing finance for measures, etc.). Support regional-seas cooperation by, for example, advocating the collation of information at the sub-region level (e.g. by Regional Seas Conventions) and supporting transboundary cooperation initiatives and projects (e.g. by the EC).